← The dawn of a new email…. Tea, the Goddess and me. The past month has been a little difficult for me, as you probably noticed, I’m not going to sugar coat it, it’s been awful! The next few months will get better they have to, spring is in the air, the days are getting visibly longer and day lights savings time kicks in this weekend all things that lead to summer, being warm by the ocean all good things. Until then what’s a girl to do? I’ve been trying a few tricks to make myself feel better during these rotten times, going back to yoga, walking and trying to take care of myself and the things in my life that stress me out. One thing from my childhood that has remained constant is tea. I know, most of you drink coffee but tea for me has always been a ritual. Tea was always drank in my house, my mom didn’t drink coffee at all, the few times she did ask for it I could count on 1 hand. I was trained from an early age to drink it, even when I did drink coffee I always drank tea at home, so did my dad. Walking into my grandparents the 1st thing that we did was put the kettle on for tea. It was served at every meal and in between. I remember for special occasions my grandmother had a small cup and saucer that was child size that she would let me use. It had violets on it and matched her dishes, I remember feeling very grown up. I also remember being served tea in a small yogourt container with lots of milk and sugar. They started me at an early age. Tea is something that gets me through a day, when I’m feeling down in the afternoon and need a pick me up, I reach for the kettle, when I get up in the morning the 1st thing (after I feed the girls) is a cup of tea and while I’m working at my desk, chances are their is a mug with it beside me. I don’t know what happened to my grandmothers cup, maybe one of my cousins has it. 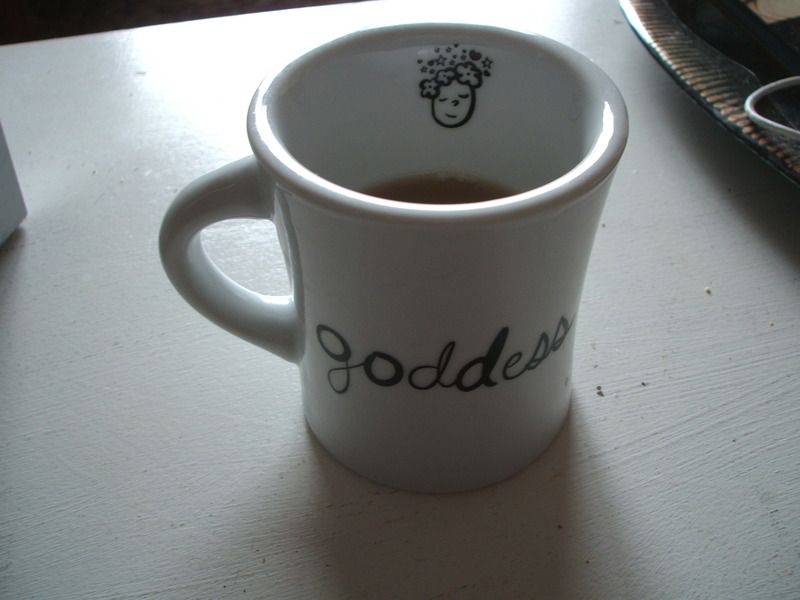 I have a few special ones I like to start my day off with and my favorite is my “goddess” mug. It doesn’t hold a lot so I’m back and forth to the pot every few minutes. I love the feel of the mug in my hands, it’s old diner ware, heavy but small enough for my hands and keeps the heat in so it takes longer for my tea to cool off. The best part is the painting on it, simple and serene, it brings a moment of calm to my day . My tea ritual has changed slightly over the years, I have found that milk and I no longer see eye to eye so we’ve parted ways and almond milk has made its debut. There is no sugar and it’s now organic black tea that is in the pot. I still drink it to calm myself down, to take that moment when things are to hectic, when the world just seems a little out of control, or to just enjoy the ritual. It is a constant for me and the Goddess in my mug reminds me to just be and enjoy. This entry was posted in Family, Food/ Organic / Local, General and tagged drink, goddess, memories, tea. Bookmark the permalink. 2 Responses to Tea, the Goddess and me. I’m with you on the tea, but I have had to switch to decaf…..no sleepies if not! Kinda bugs me, but not the end of the world either. Found a Roobios African Spice that is AMAZING! Like Chai without the kick.